On Monday night, in yet another display of histrionics over the fact that Fox’s America bears no resemblance to the real America, Glenn Beck threw his toys out of the playpen after Nancy Pelosi suggested that he might have to share them. His tantrum was over the so-called “Millionaire’s tax” under consideration as a source of funding for national health care. Needless to say, multi-millionaire Beck presented only one point of view on a complex issue – his own – and even that was poorly done, long on sarcasm and self-pity and short on facts. Video of the spoiled brat in action, along with a few points for discussion by the grownups, after the jump. Beck tried to scare the entire nursery into crying along with him right from the start : Obama’s making America a whole lot crappier! A wannabe European socialist wonderland! Taxing the rich! Pelosi the witch! Wahhhhhhhh! No transcript can do justice to the eye-rolling, desk-lolling, hand-waving and grimacing that accompanied Beck’s child star turn at playing Drama Queen. Hold your nose and watch the video. The grownups understand that there is still much to discuss and understand about the health care bill. Some people may have genuine concerns about the speed with which Obama is trying to get this bill through the House, and yes, funding a national health care plan while enacting a radical overhaul of insurance and service delivery is fraught with risk, including the “unknown unknowns” that lurk below the surface in any new venture. But according to babbling Beck, there’s nothing to discuss. The United States will be “screwed” if the bill passes, because Obama/Pelosi’s real agenda is about “convincing you to give the shaft to someone else” (translation: “Ohhhhh, poor me! Poor me!”) for the power and control of SOCIALISM. What’s to discuss? Taxing the rich will kill their incentive to get richer, and cost Americans their jobs! Cry, babies, cry!!!! → The proposed tax surcharge, as it stands, will levy 1 percent on those earning between $350,000 and $500,000, 1.5 percent on those with incomes between $500,000 and $1,000,000, and 5.4 percent for those earning more than $1,000,000. Pelosi says she wants to scale back the tax to kick in only after $500,000 for a single payer and $1M for a couple. In a less widely reported remark, she also said she wanted to “drain” more savings from the medical industry than they have already agreed to in discussions. → The CBO estimates that the House version of the reform bill could add $239 billion to the deficit over the next decade. Other estimates say over $300 billion. (A gap of $300 billion over a decade amounts to .15 percent of GDP. That’s point-one-five of one percent, or $0.0015 in a GDP dollar.) Beck, however, claims that the deficit will be a trillion. But I have news for you, blubber-boy: the trillion is the overall cost of the package over ten years, not the deficit. Duh. (See the entire CBO analysis here ) Beck got his bogus figure by subtracting the $544 million the tax surcharge could raise from a figure of 1.5 trillion which is being falsely touted in the MSM/rightwing echo chamber as the actual cost of the new plan, and by ignoring other sources of revenue and cost-saving measures. But why let facts get in the way of a good rant? His dedicated viewers might get all confused. → Speaking of those pesky trillions, the Bush tax cuts passed in 2001 alone will amount to $1.35 trillion over ten years, according to a projection by the conservative Cato Institute in 2006. 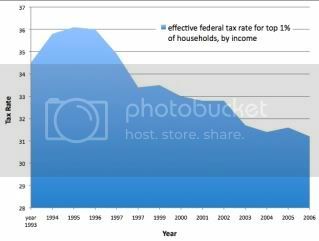 → The proposed tax surcharges would take the effective Federal tax rates for the top 1% back to where they were in the 1990’s, before the Bush tax cuts . → Billions can be saved by rewarding quality healthcare service and reducing waste, including unnecessary and duplicate testing. (It is this writer’s understanding, much of this testing is carried out in fear of negligence suits; so the entire issue of medical insurance, the extent of liability and the size of negligence rewards needs to be examined.) In order to streamline the system, money has to be spent on identifying wasteful spending and implementing the necessary changes. Simply, you have to spend money to make money, as the top 1% - including Beck - know very well. → Economist Dean Baker of the Center of Economic and Policy Research suggests that some of the added cost is “simply an accounting problem”. For instance, included in the bill is a permanent waiver of cuts in doctors’ reimbursements under Medicare, which will cost over $200 billion. However, according to Baker, it is disingenuous to get outraged over this, since Congress has always voted to waive these cuts. So it isn’t costing the taxpayer anything it hasn’t been costing us for years. (Whether or not those cuts should be waived is another matter; you can research it here). → Robert Reich, the Secretary of Labor under Bill Clinton, says that the wealthiest 1% of Americans now take home 20% of total income. That’s the highest percentage since 1928. Reich also says that there is no evidence that a surcharge on the incomes of the top 1% will decrease incentive to invest and earn more money. It doesn’t take a genius to figure that out, does it? But as we know, Beck ain’t no genius. The thing I find absolutely amazing is how Beck manages to fool himself and his viewers into believing that millionaires and the average American have common cause, when the top 1% can benefit from tax cuts like the Bush travesty which, if made permanent, would have benefited the top 1% to the tune of an average $162,000, while the bottom earners would have saved $45. But maybe it isn’t so amazing when one considers how much time, effort and money the far right have spent on demonizing centrists and liberals, ever since the Nixon years, in order to derail the real possibility of a class war by turning it into a bogus culture war. It might even have paid for universal health insurance.